Blowout Sale! Free Shipping Included! Save 51% on the BONAOK Wireless Bluetooth Karaoke Microphone with Dynamic LED Light, 4 in 1 Portable Handheld Karaoke Mic Home Party Birthday Speaker for iPhone/Android/iPad/PC/Sony (Space Grey) by BONAOK at World of Justin. MPN: BKBS001AW. Hurry! Limited time offer. Offer valid only while supplies last. 【Multi-color Dynamic LED Light】-BONAOK karaoke microphones are decorated with several colorful lights, which is wonderful for creating a party atmosphere. 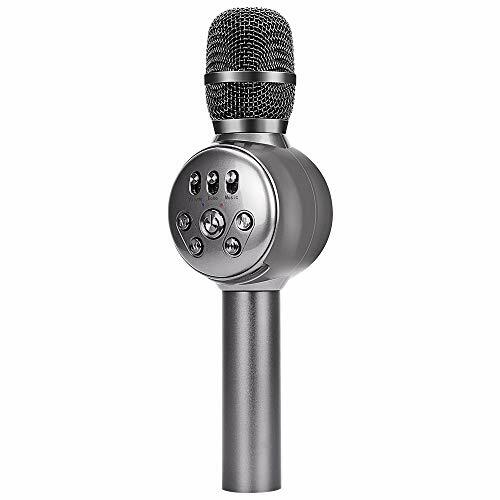 【4 in 1 Professional Microphone】-The bluetooth mics support being used as a louder mic, a karaoke speaker, and a recorder. With breathing LED lights, more funny. 【Louder Karaoke Microphone】-Applying advanced DSP technology for noise reduction, the portable mics provide a louder and clearer sound. Adjusting echo, you'll be attracted by its 360° echo reverberation. 【High Compatibility】-With a more sensitive bluetooth, BONAOK wireless bluetooth microphones can be easily paired to iPhone, Android, iPad, PC,or any smartphone. 【BONAOK Warranty】-30 days No Reason money back guarantee,1 year warranty and 24 hours friendly & warm customer service. If you have any questions about this product by BONAOK, contact us by completing and submitting the form below. If you are looking for a specif part number, please include it with your message.